1.2 First, comes rooting of the phone. 1.4 How and where does it work? How to Uninstall System Apps in Android: System apps are those preinstalled apps that you carry home right from the store when you purchase a new Android device. They cannot be uninstalled from the phone like the other apps can be. They include apps such as Google Voice search, Google Plus, etc. which we do not use much usually. So, what’s the point in keeping them? We can straight away kick them off the phone and clear the storage for stuff that we use and are likely to keep for our benefits. First, comes rooting of the phone. Go to the developer option which appears after clicking on the build number in the about phone option. Connect the phone to your PC and open the app KINGO ROOT that has to be downloaded before you connect the phone to the PC. Now yu can see that the KINGO ROOT has recognized the device. And there you are ! your device has been rooted. Now all you have to do is just install an app named Titanium backup rooted app. Just go to play store and type titanium backup app, and you will get to download it. Next, after it is installed, open it and go to the backup and restore option and then select the app you want to backup and uninstall. then click on yes for the message that appears and again yes for another pop-up notice. Finally, click on uninstall and your system app gets removed! One of the greatly used apps to remove system apps from your phone is the lucky patcher app. How and where does it work? Now finally the app has been uninstalled and completely removed from your phone storage. Happy you must be after freeing the additional space that the apps had been occupying for so long. But make sure you do not uninstall essential apps like contacts; dialer etc. or else it will brick your phone and will disable you from using the phone also. Several apps have been developed for the uninstallation of these Android apps, thus removing one of the greatest drawbacks of the Android phones. Now all you need to do when you see such unnecessary preinstalled apps are, go ahead and uninstall them. Throw them off your device and make it appear cleaner and spacious. You can also check out several other apps that play store provides for the uninstallation of the system apps! Later on, if you want to install them back, no worries there also. You have already created the backup for the uninstalled app before the removal, right? All you need to do is just click on the backed up file and reinstall it again from the’ .apk ‘ file. 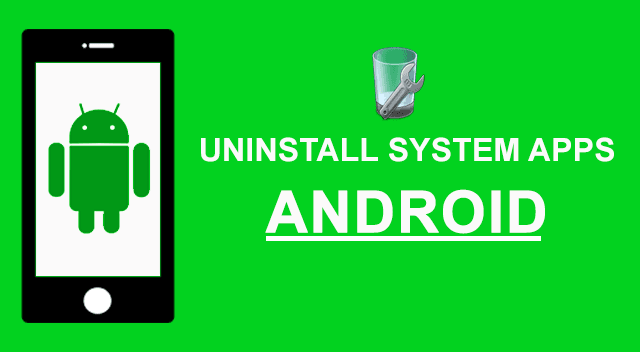 So, here we bring to you just the right thing you need for the uninstallation of the system apps from an android device. Hope this will help you whenever you are about to uninstall the pre-installed system apps. Thank you! We will get back to you with more such tricks.